The web is full of weird and wonderful video formats, and working out what program to play them with can be a bit of a nightmare. Luckily, there's VLC Media Player, which swings in and saves the day with its incredible range of supported formats. It's compatible with almost everything, supports streaming, features 7.1 surround sound and can play DVD, CD, MP3 and FLV files and much, much more. Not bad for a free program. Unlike a lot of media players, VLC Media Player requires no extra codecs for most video formats, allowing you to get going with minimum hassle. In fact, pretty much the only video format it can't play is Indeo Video 4/5 (IV41, IV51). But it's not a one trick pony; VLC Media Player has some pretty neat tricks up its sleeve. It can play zipped videos with even having to extract them first, and can also boost playback volume by up to 200%, search for album artwork and arrange videos into a playlist – useful if videos are split into small parts, for example. So when it comes to media players, VLC Media Player is the name to beat. 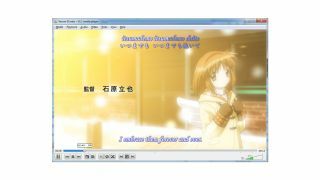 Extra features: VLC Media Player also has a number of extra features, such as being able to play zipped files with extracting them. It has basic editing tools, and can form playlists from lists of files.